Twice married and divorced, currently in a serious relationship. Two ancient pine trees watch the path to the clearing where the next full moon will bring ritual and celebration. In 2006, when I turned 50, I started seriously examining my life and my beliefs. As a “recovering catholic”, I had serious doubts about the dogma I had been fed over the years, and through research and curiosity I started exploring the pagan path. I joined a coven, and began my year and a day study. Although asked to initiate after that time, personal reasons precluded that happening. I am grateful for the experience though, and at times really miss my sisters from the coven. This was done for a friend’s new house. He was just going through a relationship breakup, and starting out new. 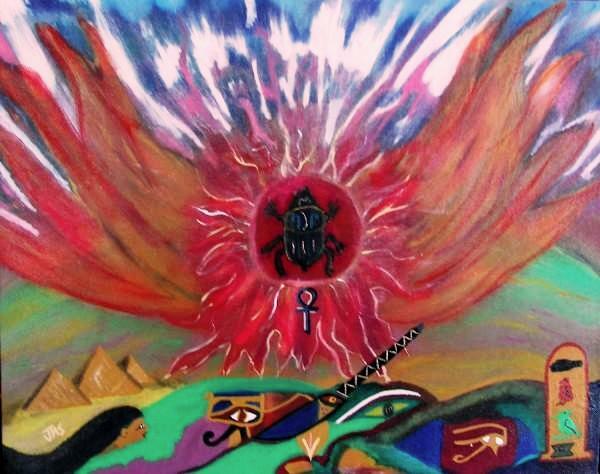 The scarab signifies his rebirth, and the tools to help him on the journey are all included, with the Eye of Horus watching over him for protection and all the knowlege hidden in the ancient pyramids at his disposal. During that year of intense growth and introspection, I began some meditation that really began to almost overflow into waking dreams. Symbols and colors seemed to overwhelm me at times. Almost by accident one day, after painting the walls in my living room I needed to clean my brush. Since I was planning on painting the bathroom next, I went in and simply started wiping the brush on the wall, and there in front of me I saw the beginnings of what was to become my first “painting”. It was the symbol of the Goddess, and it started a whole project. 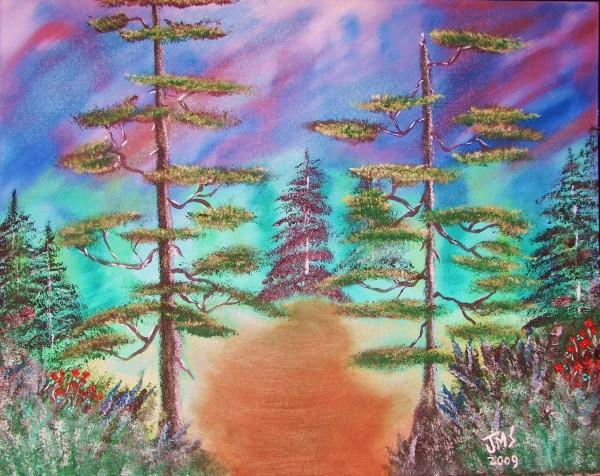 At the urging of my girlfriend, Kathy, I continued going with what she called “spirit painting”, and melded meditation and painting into one. 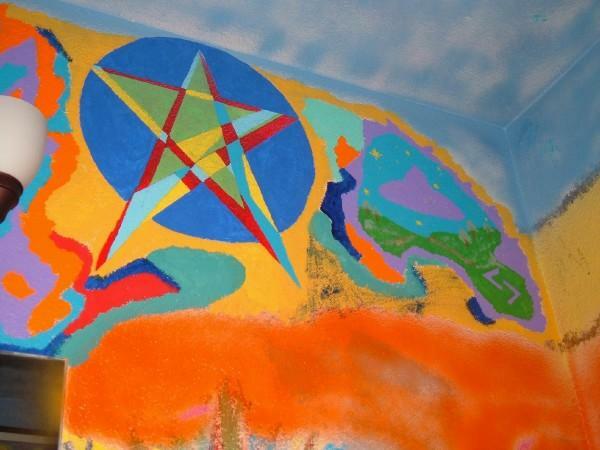 The results were the compilation of several meditative journeys, and allowed me to create a very personal “ritual room”, where daily I can reflect and think about where I stand in the big picture, while I get ready to face the outside world. Having never painted before, it was quite an experience. 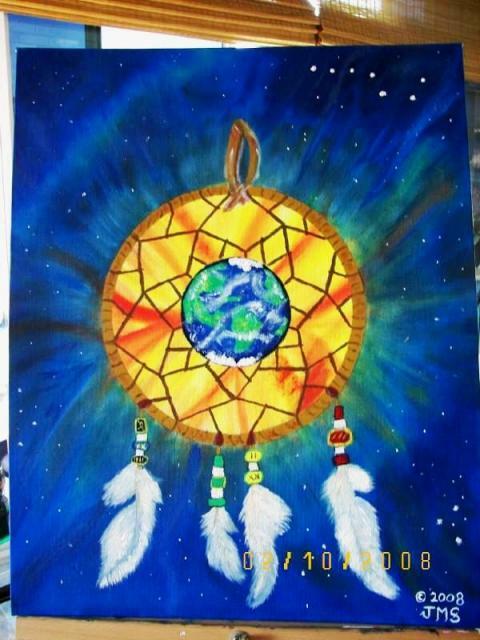 This is one of my favorites, and influenced by my girlfriend, Kathy, who is of Native American descent. It reflects where I see us, as a planet, in the big picture of the cosmos. Where just a jewel in the middle of the dreamcatcher of the Gods. From there, I was urged by my girlfriend to express myself further by exploring painting, and I gave it a go. My first attempt was a small canvas rendition of a cottage in the woods, and served to whet my appetite for painting in oils. 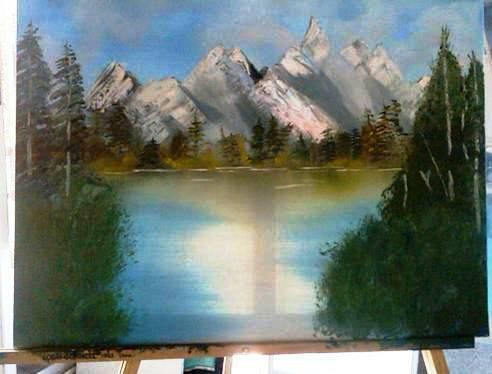 Now, I almost always have a painting in some stage of completion on the easel. I don’t have a specific form or style. I just let my mind take the painting wherever it has to go.